It’s the time to look back at the year that passed and ahead to the year that’s upcoming. And it is the time for new years resolutions! Most of us have at least some goals they’d like to accomplish. And how motivated we are during those days of the new year! And finally only happen randomly when we are overcome by a feeling of guilt looking at the fee for our gym membership on our bank account. Fast forward to the end of the year, not much has changed. Why are we not able to stick to our goals and accomplish them? Is it motivation? Is it a strong will and tenacious self-discipline? Do we simply need to watch more inspirational YouTube videos and “Just Do It”? What is really necessary to consistently pursue our goals? “Several times my daughter had telephoned to say, ‘Mother, you must come see the daffodils before they are over.’ I wanted to go, but it was a two-hour drive from Laguna to Lake Arrowhead”. After some hesitation due to the bad weather, the mother agreed and she made the two-hour drive in the rain and fog with her daughter. “We turned a corner of the path, and I looked up and gasped. Before me lay the most glorious sight. It looked as though someone had taken a great vat of gold and poured it down over the mountain peak and slopes . . . There were five acres of flowers”. In front of them lay an ocean of flowers, daffodils are far as the eye could see. Next to the flowers, was a house with a poster that read: “Answers to the Questions I Know You Are Asking”. The first answer was: “50,000 bulbs”. The second answer was: “One at a time, by one woman. Two hands, two feet, and [a] very little brain”. The third answer was: “Began in 1958”. A lifelong commitment to a goal by taking one action every day. Many people think about success and accomplishments as events. What we forget is that most important things are not one time events, no “overnight” successes, but the sum of tiny steps that we did regularly. This is what the “Daffodil Principle” is about. That’s what is really is necessary to reach our goals. Small, but consistent steps on a daily basis, while continuously refining them a tiny little bit. In the long run, this leads to incredible results. “Habits are the compound interest of self-improvement. And this is what daily habits are all about. Why habits? What about all the other factors? How can I be more motivated to take action and progress? How can I increase my willpower to overcome procrastination? How can I be more disciplined to reach my goals? It seems like many people see discipline, willpower and being motivated as the most desirable traits in order to reach the goals we have. Some years ago, I found myself just having finished an amazing workout in the gym. I was totally tired and exhausted and was looking forward to a relaxing, hot shower. As I got ready to hop under the shower and tested the water with my feet, I suddenly realized the water was cold. After waiting for a couple of minutes I got frustrated. “Why couldn’t the water get warm?” “Why could these folks from the gym not fix this”? So I grudgingly packed my stuff, got into my clothes and made my way home to shower there. I was sweating, annoyed and angry at the gym owner. When I arrived home I realized I actually should turn this anger and frustration against me. At this exact moment, I swore to myself that from now on I would „learn“ how to take cold showers. I would never be dependent on warm water anymore. So I started to learn to take cold showers. Bit by bit I let the water become colder until after some weeks I started to shower with ice cold water. And since that day in the gym, I take a cold shower every morning. Over the years of doing it every day I just became a person who takes cold showers. It is still uncomfortable and there is resistance, but I just do it. I always thought I needed motivation and discipline whenever I wanted to achieve something. But with my „cold shower epiphany“, I realized that motivation, willpower, and disciplining yourself are not reliable. Willpower is somewhat like a muscle, a source of energy that depletes over time. You can see this over the course of several days and weeks, but also in a single day, as your willpower starts off high in the morning and declines towards the evening. So whatever you set out to do, at this point it will be difficult to actually stick to it. Whether it is to pack your bag for the gym, to resist that delicious pizza around the corner, or to finish that book instead of wasting time on social media. We then wonder why we don’t have any self-discipline. So both motivation, willpower and even discipline are actually rather low ranking traits on my personal scale of consistency. Having good levels of willpower can be useful to make yourself do something and overcome laziness. However, just like motivation, willpower is an unreliable tool, so this is actually the lowest level of productivity and consistency. Discipline implies that you have to bring up a certain degree of willpower to overcome laziness. It is better than sheer willpower alone because you regularly bring up that willpower and get used to doing it, especially if you don’t feel like it. However, it’s not reliable either, since on some days you manage to discipline yourself, on others you don’t. Habits are the cornerstone of consistency. You shift from conscious effort and willpower to implementing habits that take over and run on autopilot. This is the ultimate level of consistency. It is an evolution of habits. Once you are consistent with your habit for a long period of time, these habits will turn into your identity. It will not even be a habit for you to e.g. go to the gym, you simply will go to the gym no matter what because you are a person who goes to the gym. I think this is where we want to be. Whatever big goal we have. We shouldn’t think so much about the result, but rather the kind of person we have to become and the tiny steps that are needed to get there. Goal: He wanted to be a writer. Habit: He started writing every morning, writing 1,000 words a day for a year. Goal: He wanted to lose weight and be healthier. Habit: He started running every morning. After a year, Jeff was thinner, had a book deal, a following, and a growing career. For me personally, I knew I wanted to produce more content and start to establish an online presence to spread my word and make an impact. Goal: Have an online presence with good content. Habit: Answer one question on Quora every day. After around seven months I’ve reached the 1 million answer views milestone. The habits you implement can be anything, no matter how small. Taking small steps in the right direction on a daily basis establishes lasting habits that will ultimately shape your identity. There are many great habits that get you into peak state and structure your day to show up as the best version of yourself. For example, meditation, journaling and the other habits of a good morning routine. But apart from that, what are the small habits that if you do them regularly bring you towards your long-term goals in any area of your life? These are just tiny steps that can be refined over time and will compound in the long run. With these steps, we accumulate proof of small wins. They allow us to let go of all the self-doubts, realize that progress is possible and change the way we see ourselves. This is the essence of personal transformation and self-improvement. This is what it always has been about for me. To become a better man, a better human being. Decide the type of person you want to be. Prove it to yourself with small wins. And these small wins come from daily habits. PS: What daily habits would you need to implement to reach your goals? Let me know your thoughts in the comments below, I’d love to connect with you! 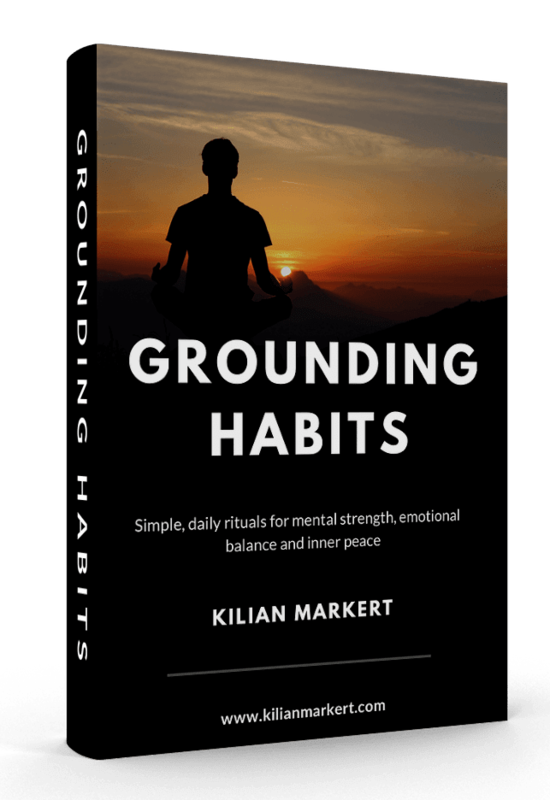 Subscribe to my weekly newsletter below to receive regular updates and tips on how to become the best, most grounded version of yourself & get instant access to my FREE e-book. Subscribe to my weekly newsletter below to receive regular updates and tips on how to become the best version of yourself & get instant access to my FREE e-book.